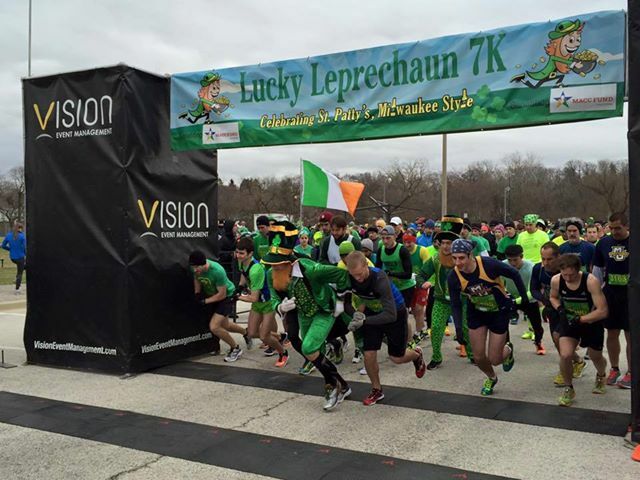 Keep Running MKE – Live it, Run it, Love it! One in five American adults is diagnosed with a mental health condition in any given year. Yet these conditions are often swept under the rug – people don’t want to talk about them or admit they’re struggling. That’s why Milwaukee native Adel Korkor decided to start the Five Fifty Fifty Run/Walk Series. 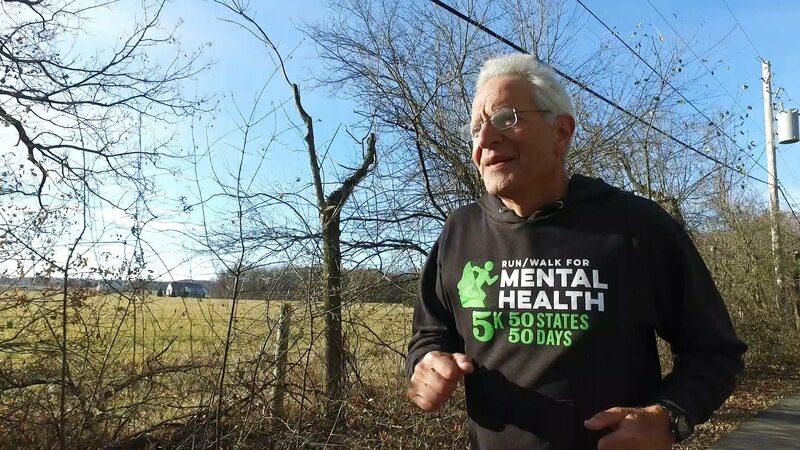 Through a series of run/walks across the country, Korkor hopes to bring awareness to the issue of mental health and help those who are suffering know they are not alone. Below, Korkor tells us more about the run/walk series and how the community can get involved! Why did you decide to embark on this journey? We have a mental health crisis in America! About 300 people are dying every day from suicide or drug overdose. Depression, anxiety and other forms of mental illness diagnoses are on the rise. One out of every five Americans suffers from mental health issues. In addition to being common, mental illnesses are disabling and costly. This run/walk series is design to bring awareness to all of the above. What’s the general route for the series? How did you decide on the start/finish? We will start in Hawaii (May 5) and end in Milwaukee (June 23). The logistics dictated our plan. We divided the country into eight regions. We will fly in between but drive within each region. The route can be found on our website www.fivefiftyfifty.com. How have you prepared for the series over the months? What type of training did you do? I have always been a runner. I have added core training and am doing more cross training with the addition of cycling and elliptical activities. 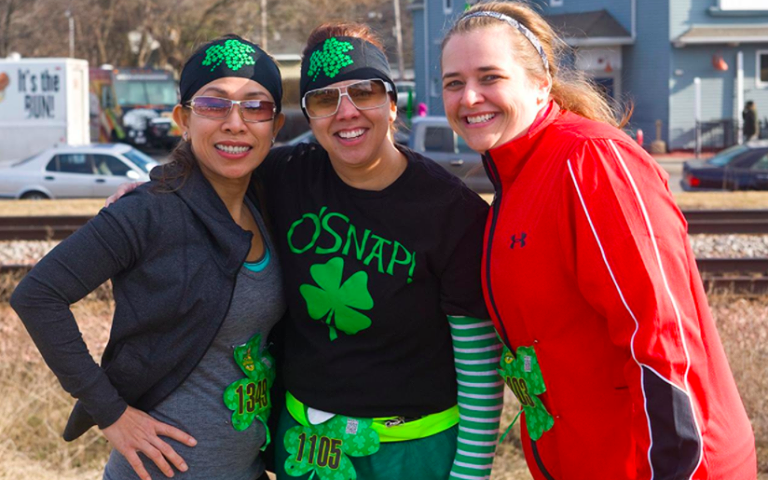 What is your run plan/approach for the 5ks? I hope to run every race. I do not have a certain time to hit. Are there any challenges you expect along the way? How will you overcome them? There will be many challenges: weather, air travel, transportation, race logistics among others. However, my team of five individuals who are managing the process are trying preemptively to deal with any anticipated challenges. Running has saved my life. I suffered from a panic attack in my early 40s and running has helped me control the symptoms of anxiety and manage my disease. What are you looking forward to most during your upcoming journey? Meeting people, sharing stories, enhancing awareness, removing stigma and raising funds. How can people participate in the Five Fifty Fifty Run/Walk Series? Go on our website www.fivefiftyfifty.com, sign up for one or more of the races. If they are unable to join the run/walk for any reason, they can sign up for the virtual run/walk. Donations through our website are also greatly appreciated. Can you tell us more about the organization the series benefits? The organization that will primarily benefit is my foundation www.adelbkorkorfoundation.org. My foundation’s goal is to make the world a better place for individuals with mental health issues. Other participating and collaborative organizations and foundations will benefit as well. There is no time to waste. We have a crisis on our hands and as a society we must react positively and constructively. Holiday shopping for the runner in your life can be a stressful, energy-zapping task. 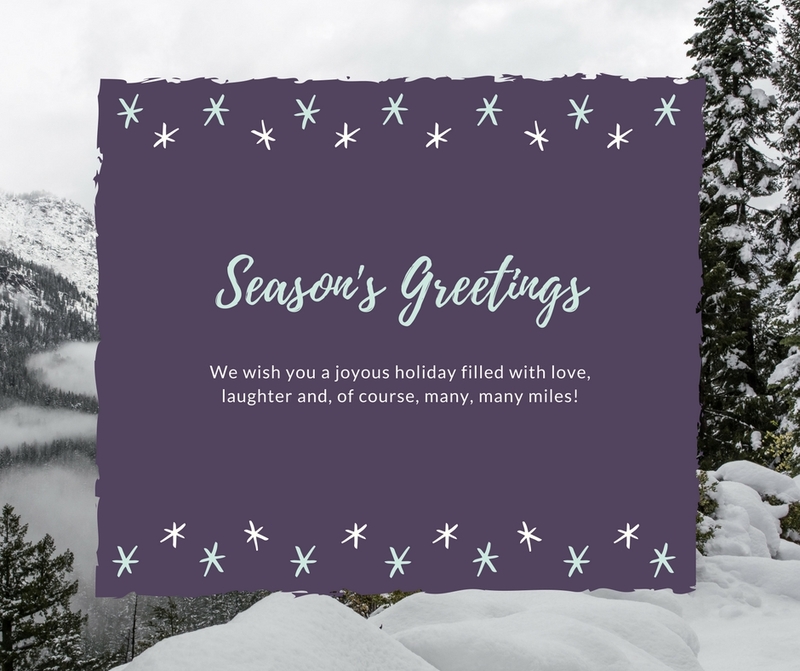 But this year, Performance Running Outfitters made things easy by providing gift ideas for every runner on your list – so you can spend more time running and less time shopping! All items listed below can be found at Performance Running Outfitters! Our running buddies make every mile go by a little bit faster. Say “thank you” with one of these great gifts, like the Believe or Compete Training Journal, with 52 weeks of space to detail workouts, or an insulated Hydroflask (keeps hot drinks hot up to 6 hours, cold drinks up to 24 hours). 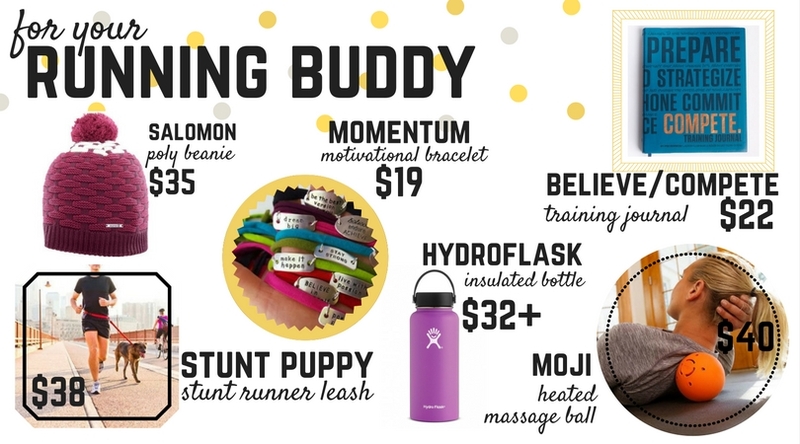 Even the most positive runner could use a little motivation, which is why we love Momentum wraps, with sayings like “Make It Happen” and “Run and Be Happy.” If you prefer running buddies of the four-legged variety, go hands-free with the Stunt Puppy Stunt Runner leash! And keep your buddy’s noggin nice and warm with a cute, fleecy pom beanie from Salomon! 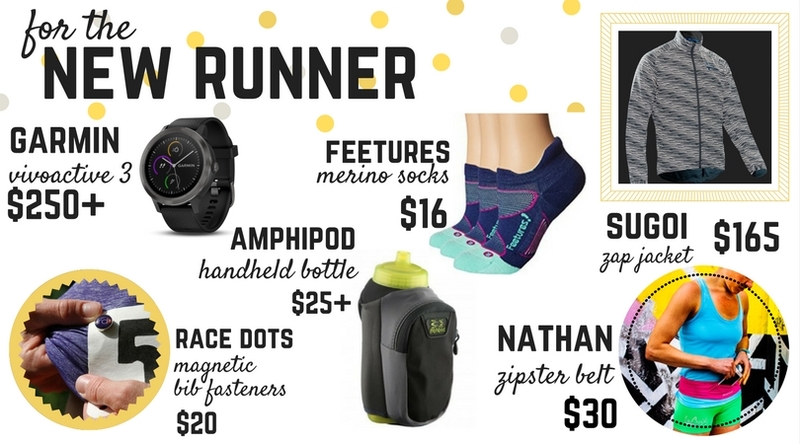 Whether there’s a new runner on your list, or one coming back from a layoff, most runners could use some updated gear. Stay warm, dry, and visible with the Sugoi Zap jacket, with 360 degrees of visibility (available for men and women). Store the essentials with the Nathan Zipster belt, with two dry zippered pockets that can accommodate phones, keys, and more. Every runner needs socks, and we’ve got plenty! (Plus, all Feetures and Balega socks are Buy 3, Get 1 Free until 12/31/17!) There’s no need to worry about hydration on the run with an Amphipod handheld bottle, and we’ve got plenty of sizes to choose from. Have a racing fanatic on your list? Give them the gift of no more pin holes with Race Dots, the magnetic bib positioning system. And finally, the Garmin Vivoactive 3 is the perfect watch for new and veteran runners alike, with built-in GPS for running, cycling, swimming and more! Running gear isn’t exclusively for running anymore! Give the gift of style with some of our newest picks, including the New Balance Heat Route jacket (women’s only, but don’t worry, we’ve got some awesome jackets for men, too!) and Saucony Freedom Runner shoes (a lifestyle shoe with a running shoe midsole, so it’s soft and supportive). The Oiselle Lux Runfinity scarf is cute and warm, with soft buttery fabric that she’ll love! We also have a fresh crop of Stance Run socks for men and women, including the new tie-dye crew (pictured). 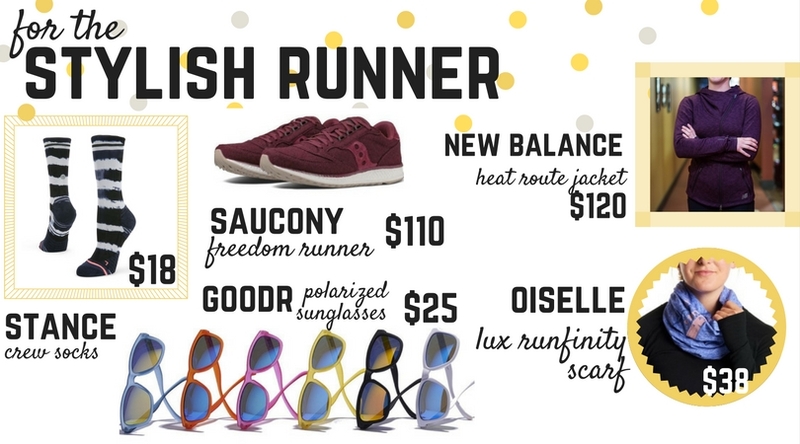 And of course, no outfit is complete without a pair of Goodr polarized, non-slip sunglasses, with so many amazing color combinations that will make any runner happy! Sub-zero temperatures don’t scare our Wisconsin winter warriors! Help your favorite runner stay warm, dry, and running all winter long with our favorites, including the Feetures Elite Merino crew-height socks, with just enough cushion and a whole lot of warmth. 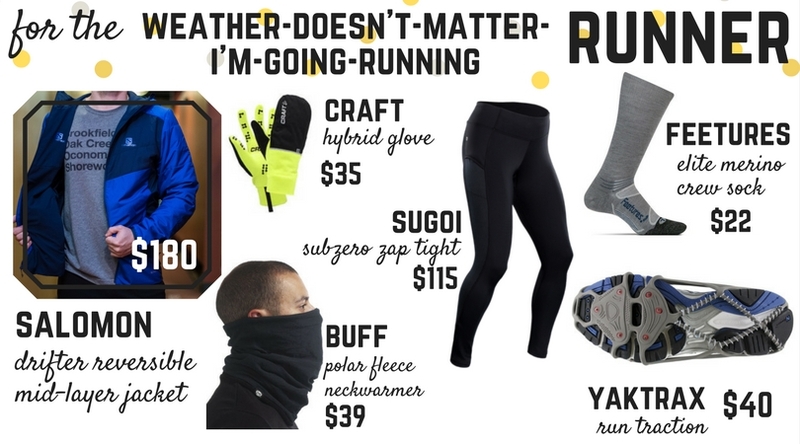 Every winter runner needs a good selection of do-it-all accessories, and that’s why we recommend the Craft hybrid glove, which can convert from gloves (with an e-tip) to mittens in a snap, and the Buff polar fleece neckwarmer, which can be converted from neckwarmer, to balaclava, to headband, to hat… you get the idea! Yaktrax Run traction devices will turn any regular running shoe into a grippy powerhouse, with a carbide spike plate and metal springs to provide traction. And of course, it’s all about the clothes! Stay warm with the Salomon Drifter jacket, made with Primaloft Eco Insulation (available for both men and women). This jacket is light enough to layer under a shell, but warm enough to tackle colder temperatures with ease. Winter runners will also love the Sugoi Sub-Zero Zap tight, with 360 degrees of reflectivity, phone-ready pockets, and a soft fleecy lining (available for men and women). Thanks to Jess and Team at Performance Running Outfitters for all the great gift ideas! Tell us: What’s on your wish list this year?